I went through a long-haired, tie-dye-wearing hippie phase in high school — just without the drugs. And, even though I've always been somewhat of an independent free spirit, I was the last person my friends and family ever expected to get a tattoo. And yet now, at 28, I have four tattoos. And I can trace all of them back to my love of travel. In 2005, right after I graduated high school, I used my passport for the first time to go on a Lord of the Rings tour of New Zealand with my mom. On tour in Wellington, we got to meet Daniel Reeve, the man responsible for the mapwork and calligraphy in all the “Lord of the Rings” films (he's since worked on tons of other movies, including the more recent “Hobbit” trilogy). 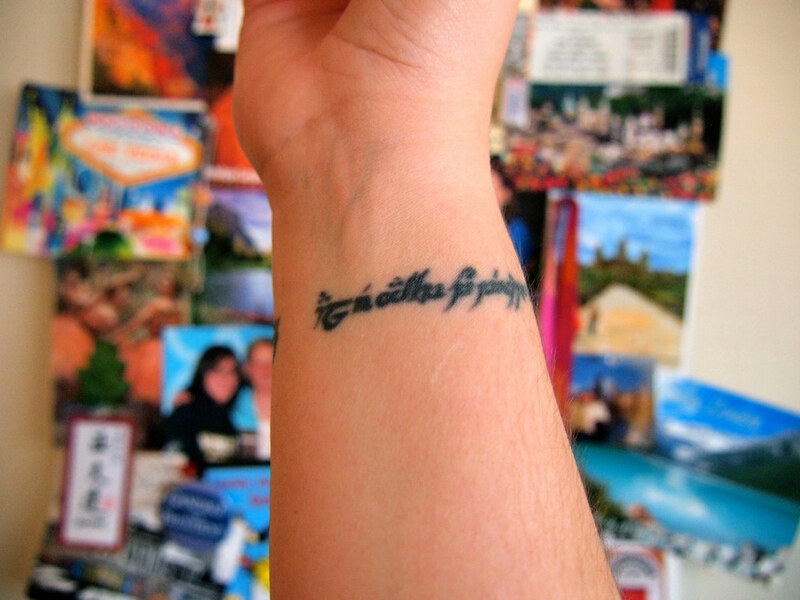 When I was contemplating my very first tattoo nearly a year later, I kept coming back to New Zealand and “Lord of the Rings.” I eventually emailed Daniel and asked him to write out one of my favorite Tolkien quotes in Elvish lettering so that I could get it tattooed around my wrist. I was convinced for a long time that I would be a one-tattoo kind of girl. But what “they” say is true: once you have one tattoo, it's very easy to convince yourself to get more. 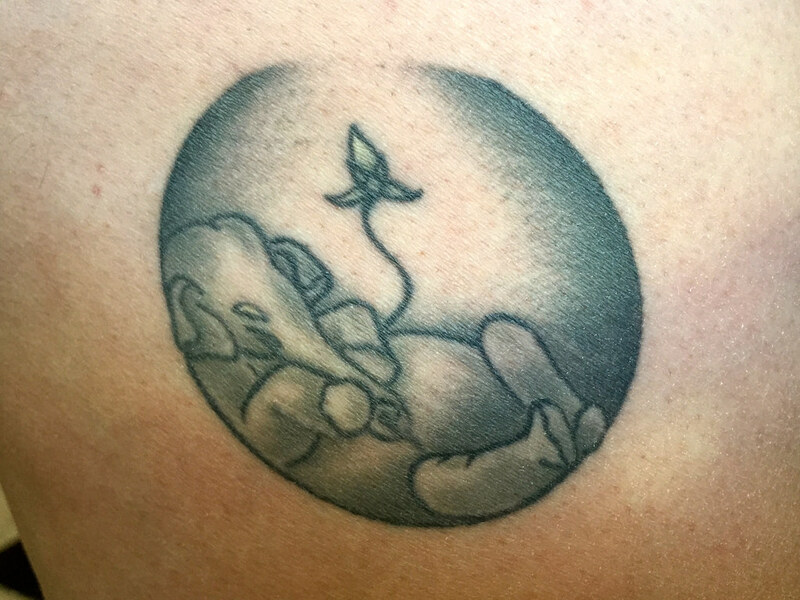 In 2012, after thinking about a design for about six months, I got my second tattoo. It's a compass rose with a globe at the center. (And, before all you smartasses ask, no, it doesn't actually work.) People often ask me what it “means,” which I find sort of a weird question, because I feel like it's pretty self-explanatory. But, in case it's not, it basically just reflects my love of travel and my desire to explore the world! I had just finished up volunteering at an elephant sanctuary for a week, so this carving really struck me. I commented on Instagram that I thought it would make a great tattoo. And then less then two months later I was getting it inked onto my thigh. 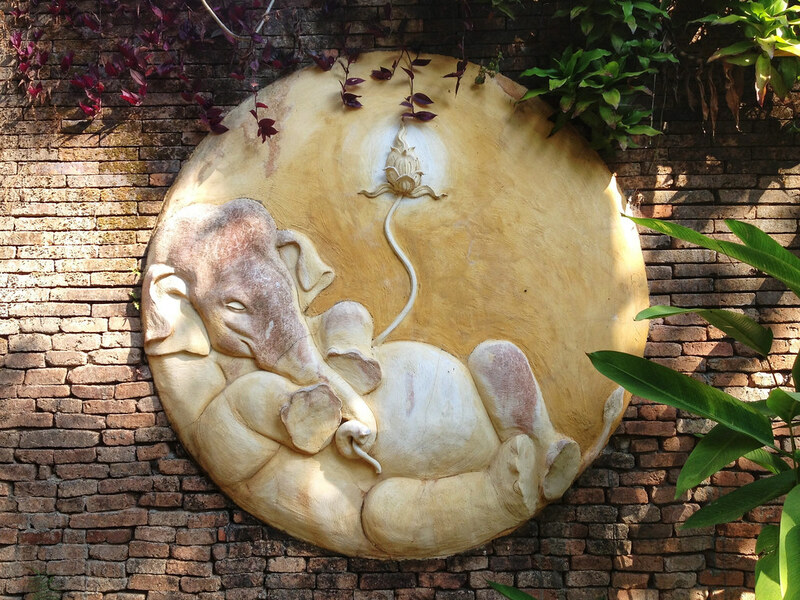 Someone commented that the carving could be of a sleeping Ganesha — a Hindu deity. I like to believe that, since Ganesha is usually associated with art, wisdom, and being a remover of obstacles — perfect for a traveler. My tattoo stories came full circle at the end of 2014, when I again found myself hanging out with calligrapher Daniel Reeve in Wellington, New Zealand (who has a ridiculously good memory, and remembered me by name!). I asked him to write out the word “Wanderlust” in the font he created to represent Bilbo Baggins' handwriting in the “Lord of the Rings” film. And then I had it tattooed on me a couple of weeks later in Wanaka at Holy Skin Tattoo. This is definitely my most impulsive tattoo to date since there was only a couple of weeks in between coming up with the idea and actually getting it inked, but I love it. I decided to put it right above my compass because 1.) I love wrist tattoos, and 2.) I thought it would complement my compass nicely. My parents are always asking me if I'm “done” yet. And, truth be told, the answer is probably no. Just as I'm always compelled to keep traveling, I have a feeling I may also always be compelled to get travel-inspired tattoos! Next up: a silver fern leaf to represent my love of New Zealand. 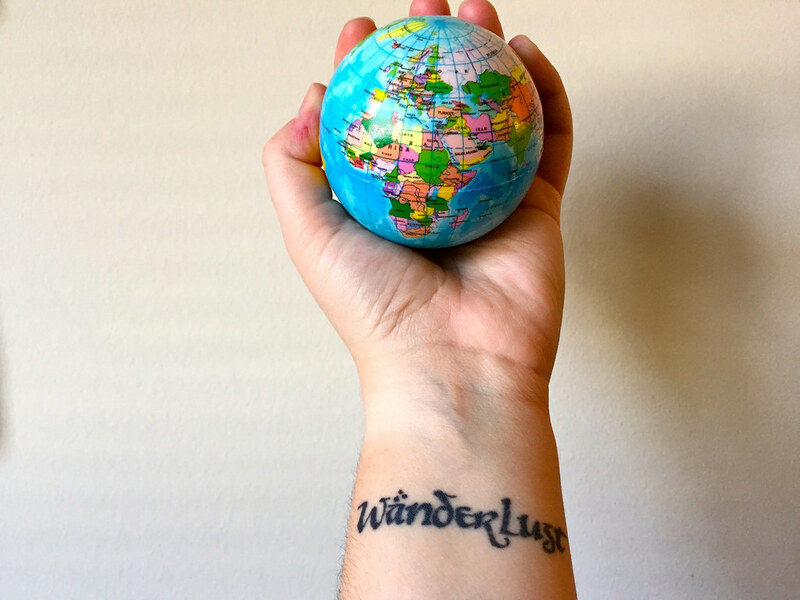 Do you have any travel-inspired tattoos, or tattoos you've gotten while traveling? I love your compass! I’ve seen some similar that I didn’t like at all but that’s really nice. I got the world map on my wrist a few years ago and so far that’s my only travel tattoo. I’m considering another that I might get done when I go back to Spain this year. 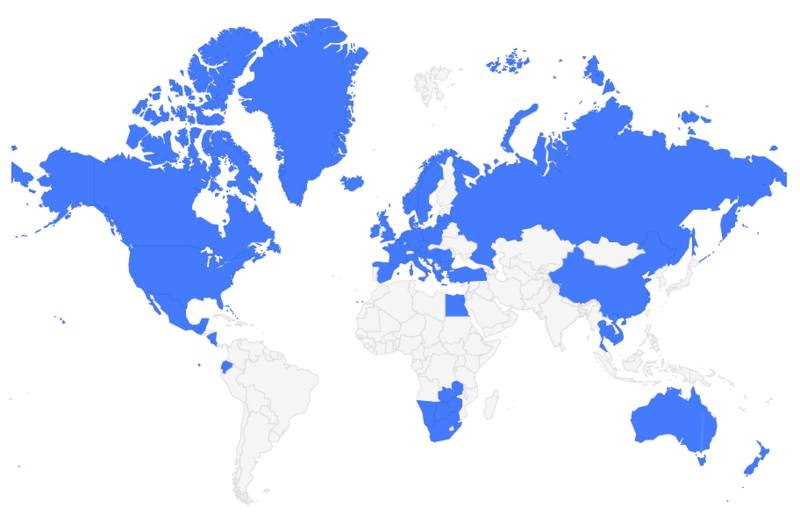 My map was done home in Australia, so I like the idea of getting subsequent ones elsewhere. I’m probably 90% decided on the design, so it’s probably time to start sketching! Thanks! And nice on the world map tattoo – I always like those. It was a toss-up between that and my compass. In the end I went with the compass, though (obviously), and am happy I did! Love it! Especially the compass. Both of my tattoos are travel related (a map of the world on my left forearm and a quote about Rome, my favorite city, on my right side) and I hope to get a lotus flower soon to represent my love of Asia. Nice! I love forearm and wrist tattoos. I’ve thought about getting another one on my other forearm, but I’m not sure how it would look. I guess I’ve got plenty of time to think about it, though! I’ve been avoiding tattoos – or rather I’ve been extending the decision process so that I’m *really* sure. Silver fern is happening in December in NZ. Perhaps I’ll look up your guy in Wanaka, as I have some hiking to do there. I also have a platypus and/or gecko from Australia that are on the list. And some text in Swedish that is meaningful to me for the next time I’m in Stockholm. Awesome! Holy Skin in Wanaka is fantastic, though they have sporadic hours. It’s run by a couple from the UK. The wife does hand tattooing – I was so bummed she wasn’t working when I was there. But the husband is also very good. He did my tattoo and it literally only hurt for about an hour. It never bled, and didn’t really scab over at all. It was healed in less than a week, which is really good for tattoos! It sounds very cute! Bird tattoos are great symbols of freedom, I think – good to know you still love your impulse tattoo! Wow I love that your ink all have their stories! I don’t think I ever could, mostly because I change my mind about these things on the daily! If I love it today I could hate it tomorrow. I do love getting henna tats done though! My travel tattoo was done when i returned home from australia; decided to get a outline of a map of australia with Australia cursive inside the lines of australia map on my calf. to remind me where and how far i came to be the person i am today. Very cool. 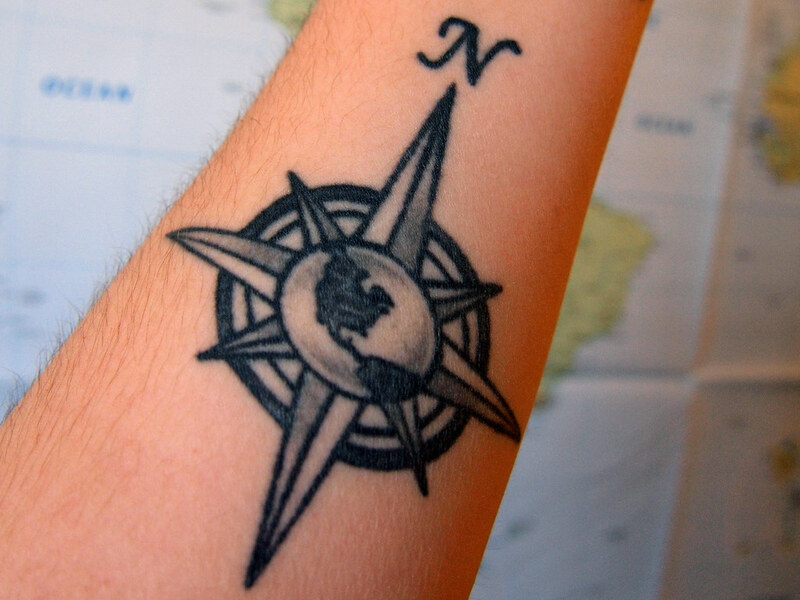 I’ve always loved map outline tattoos – I considered getting a map of New Zealand for a while. I have four tattoos – a Silver Fern on my shoulder surrounded by the stars from the NZ flag, I really want to finish that off with the word ‘Aotearoa’ but I haven’t gotten around to it – that’s more do with me with me being a Kiwi, living abroad than travel tho. Other than a daisy, which is personal, I have the words ‘Carpe Diem’ on my wrist which I guess could be used for any situation including travel. I would really love to get a plane or something tattooed somewhere tho, I just don’t know where or what design yet. Awesome! I’ve been thinking shoulder for my silver fern tattoo, too, but I’m not ready to commit yet! I love the font on your wrist tattoos! The one travel-inspired tattoo I have is “wanderlove” on my wrist, inspired by the novel Wanderlove by Kirsten Hubbard a few quotes from that book. Itching to get another tattoo as soon as possible! OH… MY… GOD! I read the three Lord of the Rings books when I was around 14 years old and I just love them! I can’t believe you got to meet the guy who does the caligraphy BUT also he wrote two of your tattoos. I mean, how awesome is that? Normally people get the same old tattoos but you kick it out of the park! Kudos! Haha, yes, I definitely prefer really unique tattoos that are personal to me! I could never just show up at a tattoo parlor and just pick something out of a book. I’ve five tattoo’s, and am just designing a 6th. 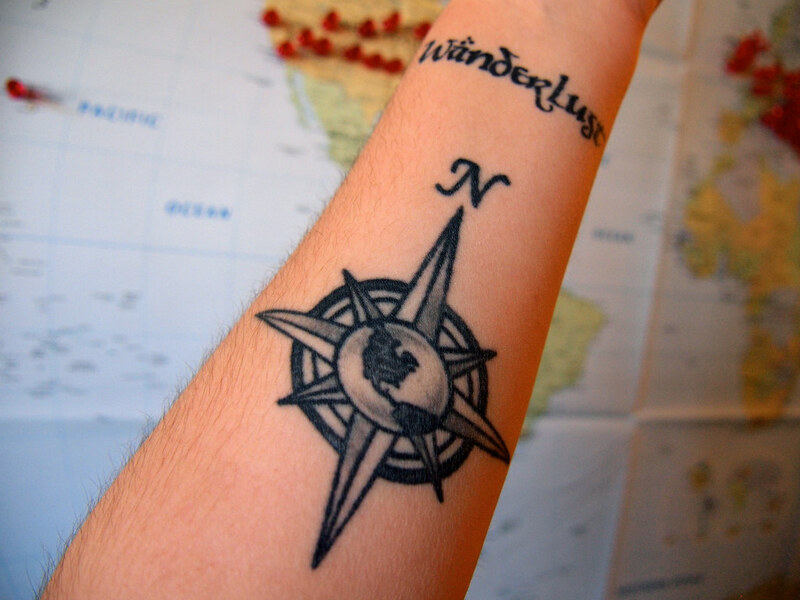 It’ll be my first travel related tattoo, a compass with scrolling that reads “Not all who wander are lost” on a lotrs style map that’ll wrap around my right calf. My other tattoo’s are, the ravenclaw eagle on my right thigh, 3 swallows on my right hip, my dog’s paw prints on my left hip, ‘Always’ (HP) on my left rib & a dandelion where the pieces turn into birds on my upper back 🙂 I also want a phoenix to go down my left thigh and have the tail feathers wrap around my knee. I didn’t know you had so many, Sammi! The map sounds really cool. Great stories! I love how all of my friends with travel tattoos always have fun stories behind each one. I don’t have any, but I feel like the bar is set very high if I ever want to get one! It’s funny, because it wasn’t until I started writing this post that I realized that all my tattoos have unique little stories. Then again, I guess when you travel so much, your whole life is a unique story! Travel tattoos are awesome! So impressed by the LOTR calligraphy! I love my LOTR tattoos. I’m so glad I impulsively got the “wanderlust” one, because I love it so much! i love travel tattoos! Your elvish quote is great! I was just in Sydney and impulsively got a world map tattooed on the inside of my left foot. I guess I’m hooked too! Ouch, didn’t that hurt??? I don’t have any foot tattoos yet, but that’s a potential spot for my fern leaf. I’m such a LOTR fan!! Love that Tattoo!! Tattoo stories are almost always interesting, aren’t they? I love all of these! I was just thinking about having a compass around my shoulder bone for a while, but have been putting it off because it would be my first BIG tattoo (over an hour) and I’ve heard that area gets a little sensitive. I’ve only just have my first recently done on the wrist and that was a breeze, but once shading comes into play, it’s a whole new ballgame! I love that you got Daniel to actually write out your tattoos for you. That’s really incredible! I have The Lonely Mountain with Smaug on my ribs. I love it because it’s not the typical Middle Earth tattoos you see around. I drove 10 hours to get it. That counts as travel, right? I’d say that definitely counts, Shannon! Very cool tattoo idea, too. These are all pretty awesome Amanda, love them! Really like that you got the Elephant too. And right where you got the Wanderlust, I have Ferweh haha. It’s addicting, and I always struggle with getting more tattoos or traveling! 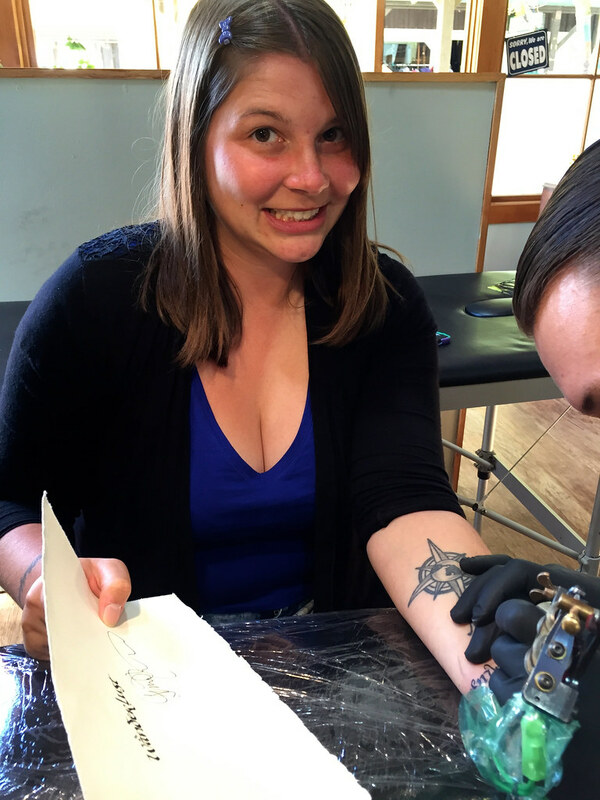 I think traveling will always trump tattoos for me… but I also have a feeling I’ll get more tattoos! Which LOTR quotes do you have? I know a lot of people who get “Not all who wander are lost” – which is a great quote for travelers! If I ever get another LOTR/Tolkien quote, it might be that one. Those are all great – I love tattoos with a story. I have two and neither is travel related, both aquired in my teen years. One desperately needs a redo as it’s quite faded and I have thought about it for years – I couldn’t think of anything with a meaning important enough to have it permanently inked….except travel! So, hopefully this summer, I’ll be turning a little chili pepper into a globe of some sort. Oh how exciting! I hope it turns out great! Well I think that definitely counts! Sounds really cute. I love compass tattoos. I have been toying with the idea for a while… For me a compass would symbolise direction and finding my direction and my way through life. Finding the right path but, never forgetting your way home when you need it or where you come from. I love the elephant and the compass tattoo. I don’t have any myself but I came close to doing so when I first went to Bali 15 years ago. Luckily, I did a skin test first as I ended up re-acting to the ink and my arm was sore for weeks! Anyway, it would have been two turtles entwined and on my shoulder. Representing the sea. Oh no! Lucky you did that skin test! I guess you’ll have to stick to temporary tattoos. “I eventually emailed Daniel and asked him…” How awesome that you had his email address and that he wrote back and did that for you!!! Very cool. Love the Wanderlust one too! Yes! I actually just got his email address from his website – but I agree that it’s awesome that he responded and designed my tattoo for me! I have never quite been in the position to actually get it. It took me 4 years to decide if I actually wanted one, then I wouldn’t be able to get it healed up before my job. I will get it at some point (I hope). I am getting Mount Rainier’s outline with my favorite quote. Sounds like a cool idea! And tattoos really don’t take that long to heal. About 10 days is normal, unless it’s really big and detailed (or if your artist isn’t that great and goes too deep!). Thanks one more time for being apart of my Travel Inspired Tattoos article. Your ink looks great, I wish I had room to included more of it. I hope we cross paths again! I don’t have any travel tattoos (yet), but I did get a tribal phoenix to represent my move from teenagehood to adulthood when I felt I had gone through a sort of “rebirth”, but it’s a work in progress. I love yours so much, though! Especially the Lord of the Rings related ones because I’m also a huge fan of that and J R R Tolkiens other works. Tattoos definitely aren’t for everybody, but I really love all of mine! Your phoenix sounds really cool, and sounds like it’s really meaningful to you. I’m picky about my tattoos – if they don’t mean something to me, I don’t get them! I love your site. I just stumbled across it a couple days ago and can’t stop reading. Nice! It must have been quite painful to get it in that spot, but it looks really cool!